We know that taking care of car maintenance can be a little bit of a hassle. 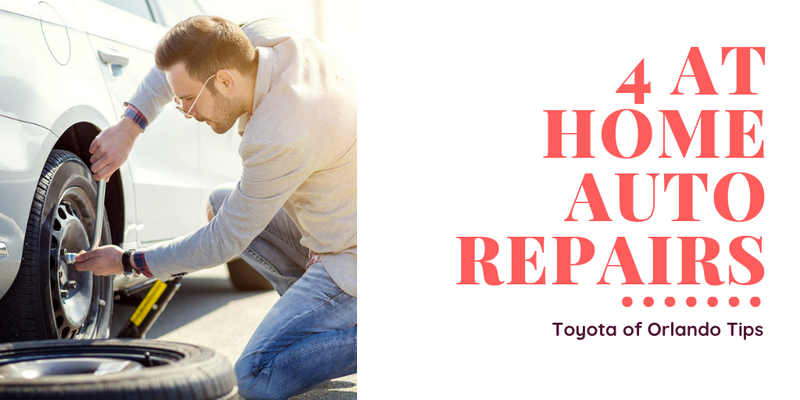 Don’t get us wrong – when you come to Toyota of Orlando, we’ll get your car in and you out the door as quickly as we can, and we offer affordable prices on all of our auto repairs so your bank account doesn’t have to take a big hit. However, we know it can be a chore when you have a million other things to take care of and don’t need another to-do on your list. That’s why our techs have come up with a list of a few at home auto repairs that you can take care of at your convenience and in the comfort of your own garage! Let’s get started. Learn how to take care of auto repairs in your own garage! At-home auto repair #1: Change a tire. Do you know how to swap out a tire if you find yourself with a flat? It’s not too complicated – make sure you’re parked on a flat, even surface and then loosen the lug nuts on the tire that’s got to go. Jack the car up (be sure to put the jack in the spot your owner’s manual recommends so you don’t damage your car), and then take the lug nuts off and remove the tire. Put the new tire on, put the lug nuts back on, and then jack the car back down to the ground. Give the lug nuts one more tightening and you can hit the road! At-home auto repair #2: Change your oil. We know that scheduling an oil change is just another item to cross off your to-do list, so if you think you can tackle the task at home, why not? You’ll need the right tools to do it – these include an oil pan and a wrench to loosen the plug, as well as a fresh oil filter and clean oil. Make sure the car is off and cool before you place the pan underneath and loosen the oil plug to let the dirty oil out. Replace the oil filter, screw the plug back in, and add your fresh oil to the engine in the designated tank. Change your windshield wipers at home and save yourself from having to drive to a service center. Buy your new wipers at Toyota of Orlando and swap them out at home! All you have to do is lift your wipers away from your windshield, lift the tab to release the old blades, and pull them off. Slide the new blades on and push the tab down to secure them, and you’re ready for anything Mother Nature has to throw at you. At-home auto repair #4: Replace a burnt out bulb. Have a headlight or taillight that’s burnt out? Don’t run the risk of getting a ticket – change the bulb yourself. All you have to do is go in through your engine compartment to access the headlight and take out the old bulb after you disconnect the power wires. Reconnect the power wires to the new bulb (be careful not to touch the glass of the bulb) and slide the new headlight into place. Voila! Want answers to questions or just feel like having us take care of your auto repairs? 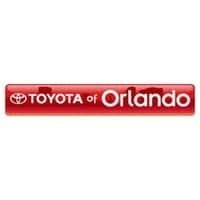 Call Toyota of Orlando today – we’re open seven days a week at (407) 298-0001!